Renewable energy: a brilliant future. Naturally! There are many comments and opinions related to renewable energy and its grade of implementation but, unfortunately, the rigor that accompanies these comments is too low. One of the arguments used by detractors is that “renewable energy is very expensive.” Well, this is the paradigm of the lack of rigor and knowledge of the subject. Let’s analyze with precision the energy cost. The graph below explains very simply the main business processes in the energy cycle: generation, transport, distribution and marketing. Well, a major advantage of renewable energy is that in most cases it is possible to implement the generation source near where its use is required and, as a consequence, near the focus of marketing. Then there is a very important first saving: Minimizing the need for transport and distribution networks as we know them today. To the extent that proliferate what today is called “distributed generation”, -producing energy where it is needed- the transport and distribution costs are significantly reduced. 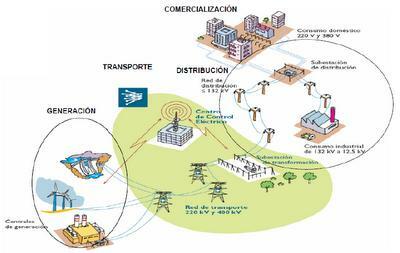 Logically, the model of large transport and distribution networks is previous to the development of renewable energy. With the rise of industrialization in the 50’s, 60’s and 70’s energy demand grew exponentially. The technologic response of the moment was to create huge generation plants -thermal at first and nuclear after that- and large transport and distribution networks. Is this model the smartest and the most efficient at present? Obviously it’s not. As argued before, it is now possible to generate power where it”s needed. Then if you fully compare everything you need to generate, transmit and distribute renewable energy sources versus the generation distributed by renewable energy, then renewables are not more expensive but also they are much cheaper. But today there is another factor that makes even more sterile the debate about renewable energy. The cost of technology related to renewable energy has decreased in the last three years to less than half, making them much more competitive yet. As an example, AvanGreen installed photovoltaic power plants in 2008 at a final price equivalent of 6.5 million Euros per MW installed. Nowadays we install the same infrastructures for 2 million Euros and with a higher yield. Why? It’s simple, among other things; the price of the photovoltaic panel has fallen over a 70% on average. The same argument can be applied to wind power and other renewable sources. And all this from a perspective of the Western world, where the cost of energy is still negligible compared to other environments where the energy cost more than triple (Africa, Asia, Latin American countries, etc.). In these environments, a traditional energy model (non-renewable) directly makes no sense. The debate about whether or not renewable energy makes sense reminds me of those who in the early twentieth century looked with fear as the first cars passed in front of them, thinking that those evil machines would not success. Just a few decades later there are two (or three) of these evil machines per family. Renewable energy has a bright future. Can you stop the progress? Simply not.